It's time to welcome home the 'Vighna Harta', the Hindu God endowed with the power to remove all obstacles. He is the God of new beginnings, of wisdom, success and prosperity. Hence for many of us, Ganesh Chaturthi is the right time to begin something new. However, the festivities surrounding this occasion vary with various parts of the country. In Odisha, it is just a one day affair whilst in states like Maharashtra, the celebrations last 10 days on such a grand scale that everything else almost comes to a standstill. With just 3 days to for the festival, it is high time to get the grocery shopping done for the various kinds of Prasadam to be prepared on the day. Except for the perishables, which of course have to wait for the last day. Different regions swear by their own version of the elephant God's favorite. But 'Laddoos' are onething that remain a constant. Almost every image of Ganesha is depicted with a laddoo in his hand or a plateful of these placed right in front of him. Hence, my special recipe for this day had to be some kind of a laddoo. 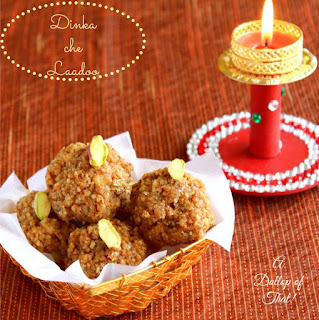 And I finalized on the 'Magaja Laddoo' or'Atta laddoo', which is quite popular in Odisha. When I was a child, these laddoos were made by my grandmother who absolutely adored them. She used to dot them with roasted charoli seeds and the combination of flavors was just heavenly. These are a specialty of the cold winter months when the hilly regions of Odisha can turn quite cold. As expected, quite a bit of ghee goes into the making of these laddoos which are said to keep the body warm. My version of these laddoos is however low in ghee. And I have further fortified their nutritional quotient by adding powdered almonds, flax seeds, sesame seeds, charoli and pumpkin seeds. 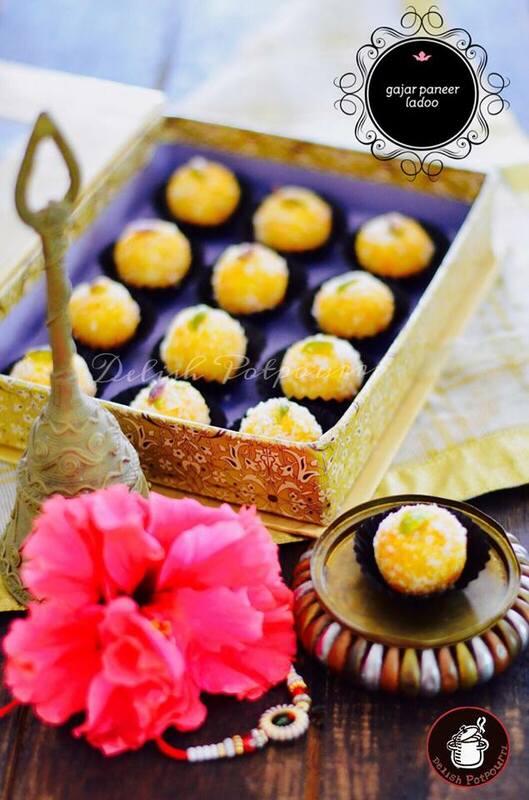 Do not forget to scroll down to the bottom of this post for more amazing laddoo recipes from my blogger friends !! Preparation - Dry roast the sesame seeds, flax seeds, charoli, pumpkin seeds and almonds separately. Keep them aside to cool down. Transfer all these nuts into a mixer jar (chutney jar is fine) and powder them. Do not overdo the grinding as these the natural oils tend to seep out. Cooking - Dry roast the whole wheat atta on a very low flame on a skillet. Gradually it will start turning a few shades darker and giving off a heavenly aroma. At this stage, add the ghee, powdered nuts and sugar . Cook for a while to bring everything together. Finally sprinkle the powdered cardamom and cloves. Mix in and remove from the flame. Let it cool a little till it becomes bearable to touch. Take small amounts of the mixture and press tightly to bind them into laddoos. Shape them while they are still warm as they tend to be fragile and difficult to mold once cooled down. Store in airtight containers once completely cool. Stays fresh for over two weeks. Saswati's Carrot Cottage Cheese Truffles / Gajar Paneer ke Laddoo !! Once again, wishing everyone "A very Happy Ganesh Chaturthi " !! 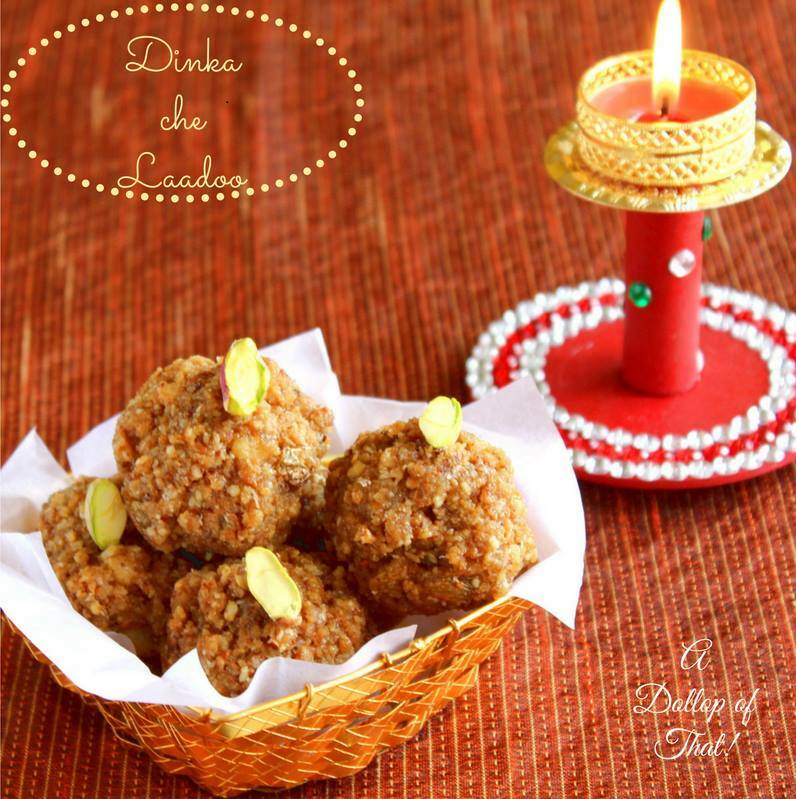 Sweta lovely recipe...a nice healthy twist to our very own Magaja laddoo.